The pandas have arrived and we are less than 40 days away from Panda Passage opening to the public. But between now and then, our incredible team is hard at work making sure that everything is ready for you to see the giant pandas. What are we working on? Pandas are a complex species with many unique needs; right from what they eat to where they sleep. As animal welfare is the zoo’s top priority, there has been an incredible amount of work done to make sure that we are able to care and provide the animals with everything they need. Tending for these special animals is no small feat – the annual cost of caring for the pandas is about $1.5 million which includes very important things like our zookeepers who care for them, the bamboo they will eat, enrichment items, Chinese specialists to help with their care and other general supplies they will need. 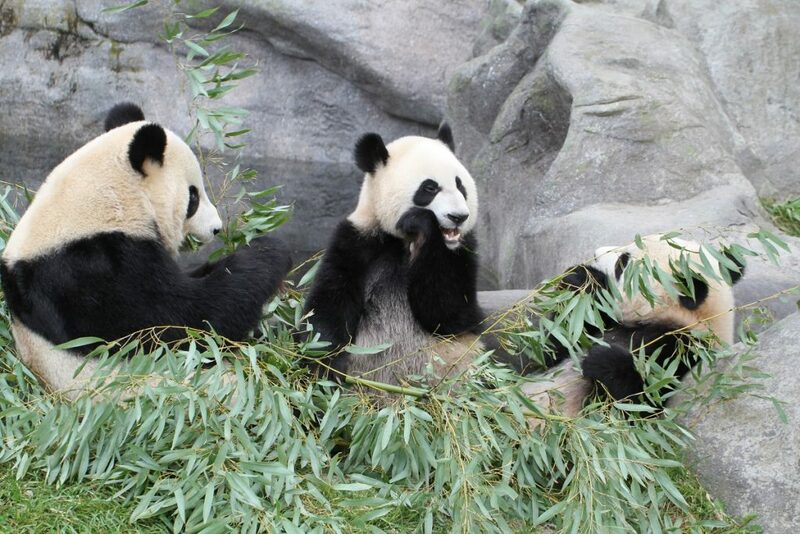 As each of our pandas is anticipated to eat about 40 kg of bamboo every day, we are gathering bamboo from China to make sure that they always have enough. This bamboo has been ethically and sustainably harvested and specifically chosen for its quality and its quantity. From harvest to habitat, it will take about 48 hours for the bamboo to arrive at Panda Passage from China and will be flown on existing direct commercial flights to minimize environmental impact. Arriving twice a week, the bamboo will be stored in a specially designed cooler at Panda Passage to keep it fresh and to have a ready supply for the pandas. We have hungry bellies to feed! We’ve transformed our former Eurasian Gateway building to welcome Da Mao, Er Shun and her two cubs Jia Panpan and Jia Yueyue. We’ve built a 1,950 square metre lush habitat – with two indoor and two outdoor areas, waterfalls, and lots and lots of bamboo! As these bears will be spending the next 5 years at the zoo, there was lots to make perfect. Not only have we created a fantastic habitat, we put together an awesome team of experts to care for the animals. We’ve gathered experts from around the planet to make sure that the pandas are receiving the world-class care we are so proud to be able to provide. When you come to visit – you will not believe your eyes! On your next zoo visit stop by and take a peek through the cutouts in the barricades to get your first look at Panda Passage. The current hoarding for Panda Passage at the Calgary Zoo, and the welcome gate just beyond. 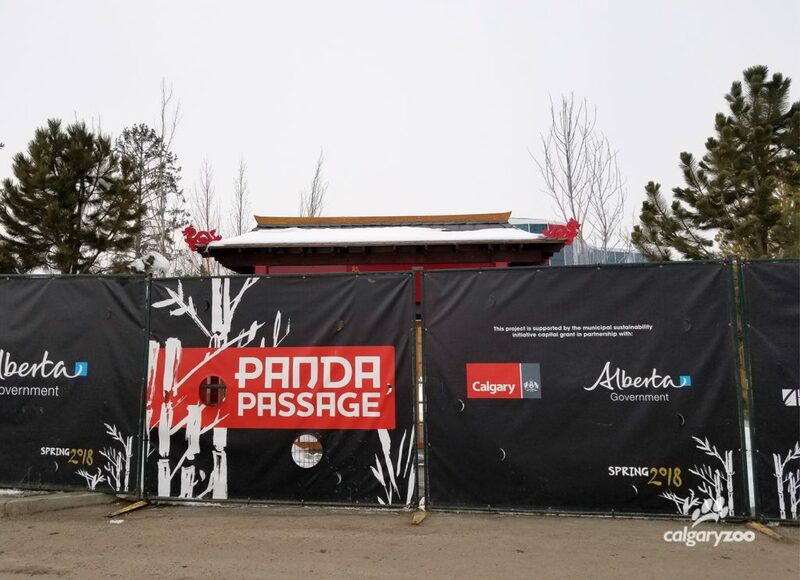 Panda Passage opens May 7! While the space is ready for the pandas, our Customer Experience Team is putting the finishing touches on making sure that you will have a great time when you visit. We are anticipating 25% more folks or an additional 1.5 million guests this year. That’s a lot of people – so we are upping our game! We’re expanding our interpretive team, recruited hundreds of new volunteers, put in new ways to navigate the zoo, and creating lots of new programming so that you can learn all about how you can save and protect animals like the pandas. 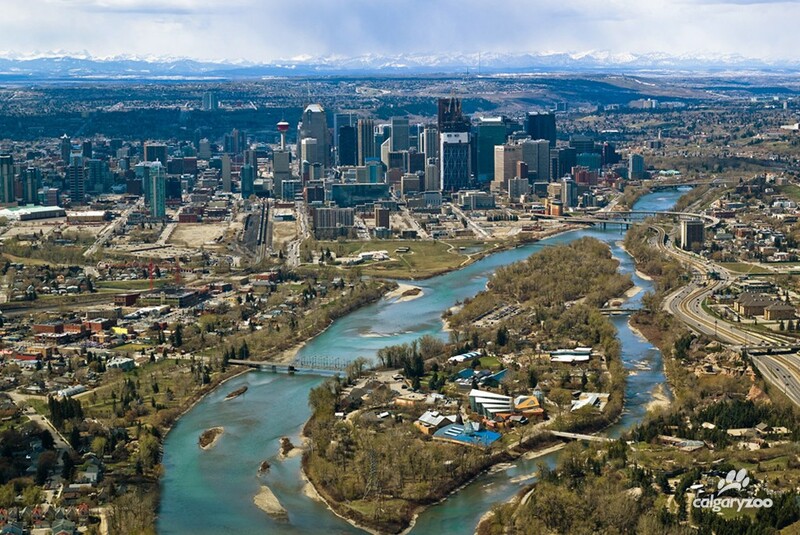 The Calgary Zoo is situated in the heart of Calgary, Alberta, just an hour’s drive from the Canadian Rockies. 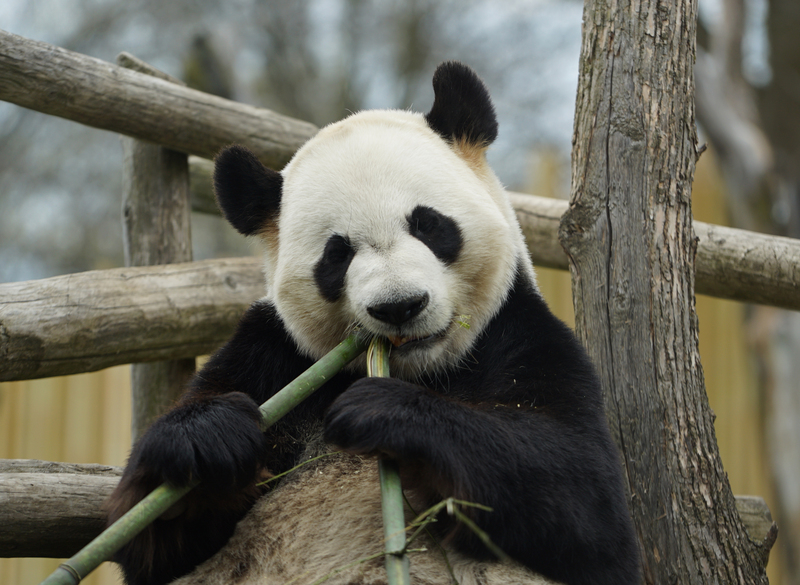 We’re so excited to welcome the giant pandas as they are conservation rock stars! 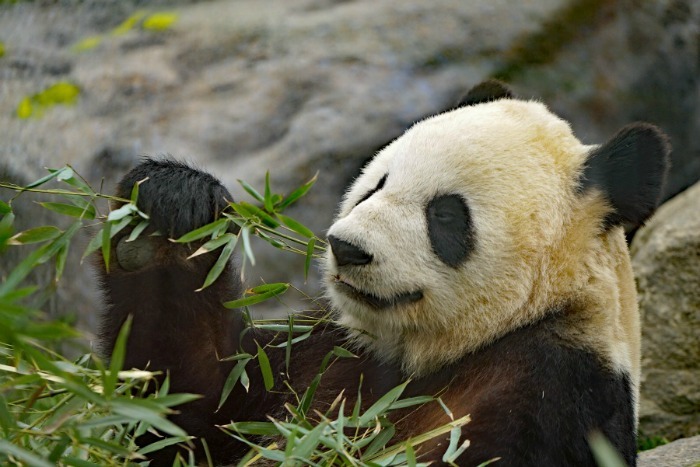 As bamboo forests are important to pandas, evergreen trees in the boreal forest are important to many animals in Canada. 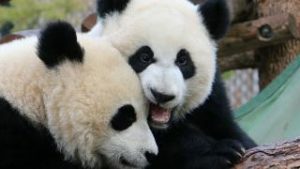 It is our hope that the panda’s presence here will inspire the public to get involved in initiatives that promote the protection of forest habitats, and remind us that the need for wildlife conservation, here and around the world, is a black and white issue. See the pandas first! Engage and Inspire zoo members get a home-court advantage with fun sneak peeks and member previews from April 27- May 4 – which means panda visits before anyone else.